Develop the literacy skills and content knowledge primary students need to meet standards. Big Books help teachers model and teach the reading of informational and literary text. 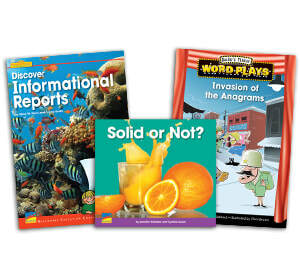 Leveled books enable students to learn effectively and proceed up the staircase of complexity. Reader's Theater engages students in actively improving their comprehension and fluency. Reading Rosie is an online resource for parents of young children. Subscribers receive an engaging video sent to their email or smart phone every day, encouraging parents and caregivers to do a learning activity with their child. Plus, kids love it. Learning becomes easy and fun with Ready Rosie. Videos are available in English and Spanish.